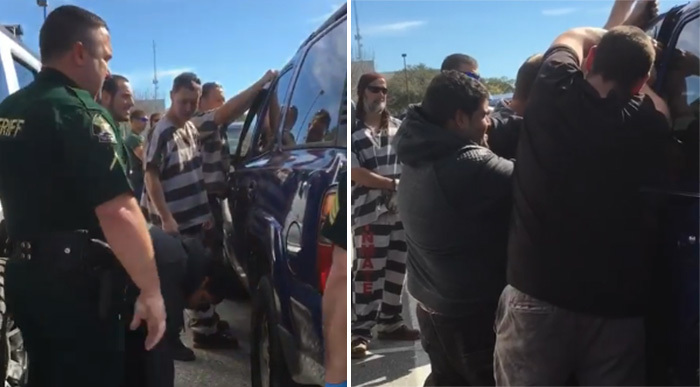 A group of inmates in Florida helped rescue a 1-year-old baby who was accidentally locked in the car by her father. Shadow Lantry, the mother of the child, said her husband strapped their daughter into the car seat and tossed the keys in the front seat. When he closed the back door, he realized the doors were locked. A group of inmates, along with deputies from the Pasco County Sheriff’s Office, were repairing a median nearby when they rushed to help. The inmates used a clothes hanger to unlock the door within minutes. “Only when deputies are around, we give permission ‘can you break into that car’,” Sheriff Chris Nocco said with a smile.